Unanet, a developer of purpose-built Project ERP software that helps organizations manage projects, people and financials in one integrated system, announces joining the Software and Information Industry Association (SIIA) to help foster the continued growth and adoption of its software-as-a-service (SaaS) and On Premise offerings. SIIA focuses on promoting the software and information industry, informing both the public and the industry on trends and happenings in the technology world, and protecting intellectual property by supporting pro-industry legislation. The Software & Information Industry Association is the principal trade association for the software and digital content industry. SIIA provides global services in government relations, business development, corporate education and intellectual property protection to the leading companies that are setting the pace for the digital age. “After proving that a web based timesheet was viable in 1997, Unanet was formed in 1998 to support professional services companies. By carefully listening to customers, we have added expense reporting, project management, resource planning, indirect costing, billing, revenue recognition, general ledger, accounts payable and accounts receivable. We offer this full suite of tools in one software, one database and one user interface. Unanet is excited to add even more value to our customers by joining the SIIA” commented Fran Craig, CEO & Founder, Unanet. Unanet looks forward to continuing to grow the visibility of the company and product within the industry through its membership with the SIIA. Along with this membership, Unanet will be able to share in more discussions with other industry leaders focusing on the challenges shaping the industry. Joining the SIIA will further enhance Unanet for current and future customers. To learn more, please read the SIIA’s interview with Fran Craig here. Unanet is a leading provider of Cloud and On-Premise software for project-based organizations. 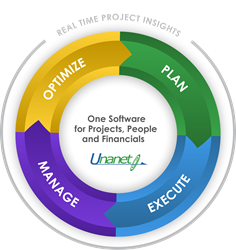 Unanet delivers a purpose-built Project ERP solution with skills management, resource planning, budgeting & forecasting, time & expense reporting, billing & revenue recognition, project management analytics and dashboards, and integrated financials with AR, AP, GL and cost pool calculations. Over 1,000 organizations trust Unanet to maximize staff utilization, reduce administrative costs by 90%, improve invoicing by 10X, and support forward decision-making for improved operations.